Time is money—acquirers must operate fast or fail. Of course, raw speed is not enough to guarantee success. Integrating badly at a high velocity is as big a mistake as moving slowly in hopes of avoiding error. The secret is to move more rapidly—to accelerate hard—but to have the right touch at the wheel. Speed is an essential element in the right integration approach … it’s just not enough by itself. Our training provides the additional ground rules that position acquirers for success. We cover the concrete principles that collectively are the foundation of our proven, trademarked M&A integration methodology. We teach a methodology which has an authentic quality that comes from surviving trial by fire. 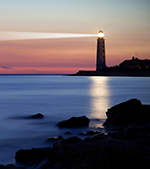 PRITCHETT’s approach has been developed in the trenches on client's integrations for over three decades. Countless merging companies have used our integration process to successfully mobilize their teams across functions, locations, and cultures. We cut through theoretical bull, popular misconceptions, and wishful thinking on cultural integration. Culture change is arguably the most misunderstood, mismanaged area of M&A. Merging companies frequently waste money and time analyzing cultural differences that are benign and not worthy of investigation. PRITCHETT’s methodology identifies the few cultural traits that carry enough voltage to impact the bottom line. Our workshop teaches how to zero in on the mission critical variances and make the necessary cultural shifts while also maintaining focus on other integration priorities. Our training has no mushy theory. No timewasting trivia. No touchy-feely stuff. We teach participants how to create the deliverables for an integration, who should create them, and when. And we include useful tools and down-to-earth, real-life examples. In the name of getting everything done, merging companies often overextend and dilute their resources. Our training teaches participants how to ruthlessly prioritize and scale back the workload so more of what is truly pivotal can be accomplished. Usually, only a handful of things in an integration will deliver a huge payback. A targeted, sustained focus on these areas, the value drivers, provides the greatest chance of delivering the right outcomes on time, within budget, and without burning people out. Integration methodologies advocated by some M&A advisors include complicated rules that create confusion and add no value. In some cases, acquirers feel compelled to hire consultants on an ongoing basis to navigate the very complexity built into the process by the same consultants. An effective methodology should make an organization more self-sufficient, less consultant dependent. PRITCHETT’s approach is highly teachable. Not over-engineered. A person needs common sense and resolve, not an advanced physics degree, to understand and apply it. The yin-yang symbol represents the ancient Chinese understanding of how things work. In the context of merger integration, think of the white area (yang) as the “hard stuff” and the black area (yin) as the “soft stuff.” Yang is project management, yin is people management. 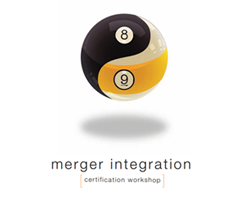 Unlike other integration workshops that take a piecemeal approach, PRITCHETT’s program covers both the yin and yang. Too often, merging organizations concentrate too heavily on one at the expense of the other. 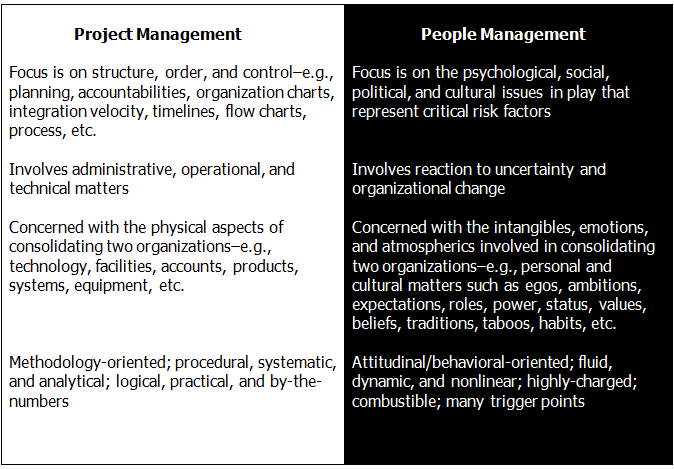 Both project and people management require adequate attention in order to realize the full potential of an acquisition. ­ - Trained over 30,000 managers in M&A integration, more than any other firm. Companies often struggle through integrations because managers have been taught little about the process or, even worse, have been taught the wrong things. many of the correct moves are not obvious. The workshop offers counterintuitive guidelines that you are unlikely to learn anywhere else … except by painful trial and error. At the end of the workshop, participants receive a one-year subscription to MergerIntegration.com where they can access videos, playbooks, checklists, PowerPoint presentations, tools, and completed deliverables selected from successful PRITCHETT merger integration consulting and training engagements. Each participant will receive free online access (for one year) to PRITCHETT's eMerger software ($4,995 value). eMerger is packed with more than 80 integration tools, templates, checklists, matrices, and examples of actual task force deliverables. eMerger helps teams produce work in consistent formats. This consistency facilitates the roll-up of data so more informed, quicker decisions can be made. Participants who pass PRITCHETT’s exam will receive the credential, CM&AI. The Certified M&A Integration (CM&AI) designation signifies you have taken the most in-depth available course on merger integration, mastered the content, and developed a core competence in acquisition integration. The only accreditation specifically for M&A integration professionals is the CM&AI.